The Battle of Bitcoin Forks has begun! How to participate? A year ago one of the most disputable bitcoin forks – Bitcoin Cash (BCH, Bcash) has appeared. After BCH’s success, the interest to forks grew up immediately and nowadays the amount of imitators counts in dozens. But who of them possesses the most loyal community and has a right to be called “The king of the forks”? That is what the most reliable crypto exchange P2PB2B wants to find out in “the battle of Bitcoin forks”. Absolutely all Bitcoin forks can take part in the vote. Users vote for their favourite coin. 8 coins with the largest amount of votes pass in the second round. The voting lasts 7 days. After the play-off stage the final stage of “the Battle of Forks” begins, it lasts 5 days. The coin having the highest number of votes wins. How can i vote for the coin? The voting is free! To protect the voting from vote-wrapping only registered users who have at least 0.0003 BTC / 0.05 ETH / 25 USD on their wallet are allowed to take part in the voting. You can vote only once during qualification and final stages. 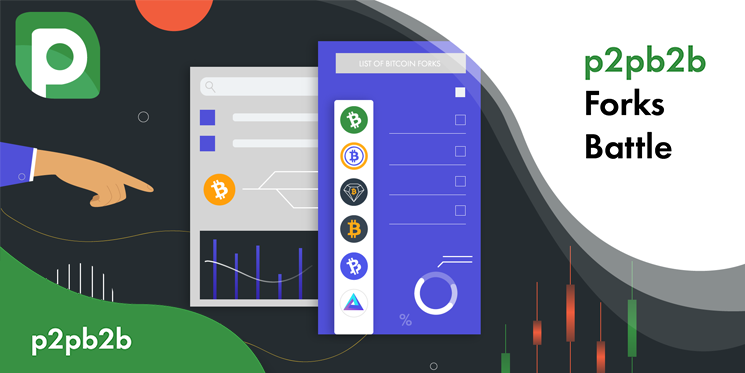 The coin which wins “the Battle of Forks” gets a free listing at the most reliable crypto exchange P2PB2B. The coins which got to the play-offs get special listing terms within a month of the announcement of the results of the battle. Next Post 3,2,1 – Go! p2pb2b Referral Program Starts Now!